What's Alan Watching? : Community, "Football, Feminism and You": I'm not an alien! I am a Human Being! Community, "Football, Feminism and You": I'm not an alien! I am a Human Being! My day's starting to get bogged down, so I don't have time to say much about last night's "Community." This is a couple of disappointing episodes in a row they've done - here, the only storyline I really enjoyed was Pierce and Dean Pelton teaming up to design a mascot - and while I'm still not worried about the show (every comedy has off-weeks, and new ones in particular can take a while to find the right balance of everything), I'd like to see them hit another one out of the park, and soon. A few LOL moments in this episode, notably the Seal/Seal's teeth line, and the indignant, "Is this your first pep rally?" and "We're standing right here, we can here you," jokes. Yeah, the anonymous football player had the best bits of the episode. But Troy's conservative high school taunts were good, and the closing bit with Troy and Abed's security guard doppelgangers was a nice touch. I don't know, I like the show plenty; frankly, I think it's funnier than Modern Family, a show that strives much harder to have a heartwarming ending in each episode. Granted, Community is the show trying to pass off Alison Brie as an 18-year old when she's also Pete Campbell's WIFE. Still, I thought it was funny, and once again managed to place different characters together. This one is my favorite new show of the year. I have to disagree Alan, I thought this episode was great. My favorite part was Troy and Annie's out-dated conservative high school chants. I enjoyed tonight's show a lot more than 30 Rock (although I am hoping 30 Rock will step up its game soon). I found this one maybe the best of the year. (Britta is however trying my patience)- thought the football stuff was good and liked the resolution where Jeff and whatshername were wrong - it was okay for Troy to play football. Another episode aired out-of-order? Jeff was still hitting on Britta and the Dean Pelton was introduced this episode as if it were the first time we were seeing him, even though he was referred to as the Dean last week. The cinematography on this show is pretty amazing for its format. Particularly during the scene where Troy comes into the cafeteria to let everyone know how awesome he is ("The only thing I need to know about the universe is that I'm at the center of it"). I think there was a long stretch of uncut shot that you don't usually see on a half-hour comedy. Not that cinematography should determine a show's fate, but I appreciate the effort everyone in the cast & crew is putting into this show. I have to say that I actually liked this and last week's episodes, while I really disliked the first few. There must be something in these episodes that are turning some people off but that I personally really like, and vice versa with the first few episodes. To be honest, I was just about to cancel my season pass until I saw last week's. Alison Brie makes the show 100x better. How old is she really? I appreciated Abed's comment on the UST that Alan had referenced not a week or two ago! Are the writers playing into the worn out plotlines that every moderately successful (and nearly all of the unsuccessful) TV shows use nowadays if only to make fun of it? If so, I hope Community has the legs to make it far enough for a good comedic payoff. Alison Brie graduated High School in 2001 if you need a benchmark. I'm digging this show and modern family. I love all my my new shows equally. Keep in mind that Trudy Campbell's not supposed to be very far out of her teens. People married younger in those days, and young adults tried to act like older adults as soon as possible. And I'm not sure Troy and Annie are supposed to be 18 exactly. They're definitely the youngest in the group, but Troy needed time to go to his original college and blow his scholarship on the keg flip, then rehab his knee, and Annie might not have gone to school right away given her other issues. So they could be 19 or 20. If anything I thought this was the funniest episode of community I had seen yet. I have watched all the other episodes and had reached the point where I wasn't necessarily going to continue on with the show, but this one had some good moments. It was a strong Abed episode despite him not figuring prominently - his very self referential bits worked, and the bathroom bit had a strong ending when Annie got shut out of the hug. Jeff was funny too - he had good interactions with the Dean, Annie and Troy, and minimal tired stuff with Brita. Annie specifically said "you made an 18-year-old girl cry" in this episode though. I really enjoyed this one, almost all of it. They continue to prove that any pairing among the cast will work for a comedic story line. The "That's racist - that's gay - Damn" interchange completely cracked me up. The Human Beings team, and then the mascot, were funny in a very different way. And Abed is the perfect character to go meta and first remark on UST and then say he overdid the TV references last week, so he's gonna go light this week (and then virtually vanishing!). Great stuff. Actually, I laughed my bum off this morning when I watched it on Hulu. The repartee between Troy and Jeff on the football team was hysterical, as was Troy's conservative football chants. And the mascot was downright terrifying. I thought they used all the characters well (I really like Shirley), and they even addressed Britta's prickly chilliness by the other characters, and softened her a bit (but made her punchy advice to Trudy at the end work, because Trudy needed someone to give it to her straight.) It makes me laugh consistently, so it gets a big check in my book. My understanding was that Troy blew out his knee in high school, when a college scout there to see him. Sorry Alan, gotta disagree. My wife and I missed the last few weeks of the show, and when we saw this one we both said "WHY are we missing this show? It's the funniest thing on TV now that Hell's Kitchen is over." I enjoyed this episode and personally I rather watch Troy and Annie hook up than watch more of the Jeff/Britta snooze fest. I thought this episode was solid through and through. The exchange between Troy and Jeff was brilliant, and they did a great job fleshing out some of the secondary characters, notably Troy and Annie. They easily could've been one- note and dimensional but each showed a surprising and welcome sense of self-awareness. Yep, this episode was aired out of order. I believe it was supposed to be the third episode, which is why we still had Jeff hitting on Britta and the introduction of the Dean. I feel like Bizarro Alan, because the Human Beings was the one thing about the episode I didn't like. In fact, each episode since the pilot has had one storyline that just doesn't work for me at all, but the rest of it is so good I don't mind. I like that each single episode plays with a different set of dynamics within the group, and how they wound up leading you to think that they were going to go with the traditional sitcom ending only to twist it at the last second. It's nice that Jeff doesn't have to redeem himself every episode. I really love this show, but I wonder where it would go in season 2, season 3, season 4. This would be the perfect show to do 6-12 episode seasons. I really love this show, but I wonder where it would go in season 2, season 3, season 4. This was probably the episode with the least amount of laughs for me, but I thought the character beats were more than good enough to make up for that. Even if the writing has been uneven so far, and the character arcs are being fudged by the episodes airing out of order, the actors and directors (and by extension, the shooting crew) are doing consistently great work every episode. Also: that mascot was seriously creepy. Yup, but in theory the school could have a university satellite on campus. If he's trying to lie low, and I get the impression that's why he chose community college, to avoid anyone he might know (outside John Oliver's character), they could have him still on the campus working on his Bachelor's through a partner school. Though, that might require them to rotate out other characters. All the funniest lines are about how lame and derivative the show is mostly delivered by a character whose sole purpose is to point that stuff out. He is the most popular character. I will still watch this show for now, but the ceiling is so low, it would have to morph into a completely different show with an entirely new premise to become something consistently good. I laughed a lot. The only thing I didn't care for was the opening with Abed once again being meta. Good that they realize they're overdoing it but still HATE when they do it. One of the best episodes yet, though the Abed being meta thing is annoying. It doesn't really work for this show. i think the show finally hit it's stride last night.. but it still has that weird "out of order" feeling everyone's been mentioning. The seasons don't necessarily have to equate to academic years. I could easily see the season finale being the end of their first semester. They could always pull a Lost and spend 4 seasons on 80 days and then jump forward and backward multiple decades each week thereafter. I generally agree with you on all things TV, but i have to disagree about this ep. I was laughing out loud all night, especially at Jeff manipulating Troy and thinking for him. Pierce and the Dean were the only part I didn't like. Big Chevy Chase guy, but i haven't really enjoyed his character yet on the show. Very satisfied after last weeks dud. Thought this was by far the weakest episode of the season so far. Only laughed a few times as opposed to throughout the entire episode. I loved the part where Jeff and Troy went 'that's racist, that's gay....right back up to that's racist'. Not as great as it could be, but I liked this episode more than last week's. Oh, and on Allion Brie's 'age', remember that even when she plays Trudy, isn't Pete and Trudy a young couple, maybe mid twenties or so? So I don't see it as that far off. I liked this episode a lot, but I LOVED the closing bit with Abed/Troy and the security guards, and the tentative homage to Harpo Marx's mirror routine. Those closing bits over the credits are often the funniest part of the show--which isn't a slam to the show, but rather a nod to how funny the closing bits are. I, too, found the Human Beings mascot story line the weakest, although I do find the dean hilarious. I loved Shirley's take on the role of women in the bathroom. I do find the Jeff/Britta storyline the least compelling, and they really didn't spend much time on it, so it was fine. And I adored the opening meta-jokes with Abed. As someone who has been in Community College for a very long time, I can attest to the amount of people who drag it out. Sure, there are a lot of people who go for a couple years on their fast track to a Big School, but that's only maybe half. And I wouldn't think any of these folks, aside from Jeff, is on an accelerated timeline. Also, I think Alan missing the explicit references to Annie's age and when Troy got injured sums up perfectly how unengaging he found this episode. I kind of agree, but it still made me laugh more than enough, and the post credits bits with Abed and Troy continue to nail it. I work with transfer student information at a 4-year-college. MANY MANY MANY people take 5-8 years to get a 2-year degree from a CC. The CC in my hometown is infamous for not having anyone graduate before 8 years or so. These folks may never leave. I actually rather liked the episode, between the breathtaking racism and Jeff's perfect summation of it, and Britta's not comprehending Girl Behavior. Good times. I'm not sure why, but the episodes you tend to find weak of this show are the ones I like the best. I do agree that the quest for the human being mascot was the best of the subplots. I think I also enjoyed this one since it didn't focus on the Jeff/Britta relationship, which I find forced and tedious. I thought this was a great ep, lots of laughs. Seal/Seal's teeth was awesome. I also quite liked the whole women's washroom storyline. I kind of feel like Bizarro Alan for a lot of eps of different shows that last little while too, haha. I've watched every episode of the show so far and was utterly baffled by what Alan saw in it. This was by far the best episode of the series so far, from the banter between Jeff and Troy on the field, to the follow up right before he went into the pep rally, this episode showed the promise of the series more than any others. Comedy is as subjective as what's sexually attractive. I STILL don't see what Alan sees in "The Big Bang Theory." This though... This was funny. 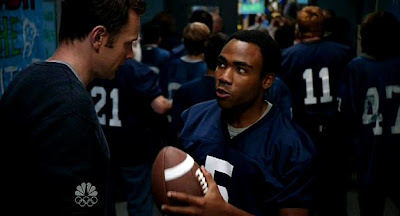 "I'm saying you're a football" player! It's in your blood! Funny show, but it's becoming more and more obvious that no one involved in the show - and i mean no one - has EVER attended a community college class, visited a community college for research, or so much as clicked onto a community college website. It's petty, but it's becoming an obstacle with every storyline they attempt. Recruiting a student to play on the football team? Choosing a school song? Tenured professors holding research experiments? These things don't go on at a CC. The show would work better if they would've just called it "Glendale": small university with NAIA or D2 sports, limited on-campus housing, and a mostly commuter student population. Those schools exist around the country and would get the point across just as easily.